I’m told that Buttermilk Pie is a southern treat. Maybe that’s why I’ve never had a slice before. Like a lot of regional specialties, even though the ingredients can be found anywhere, the recipe just isn’t part of the local culinary culture. But I like the sound of this simple sort of pie. I happened to have some pâte sucrée tart dough I wanted to use up so I rolled out these Buttermilk Tarts. 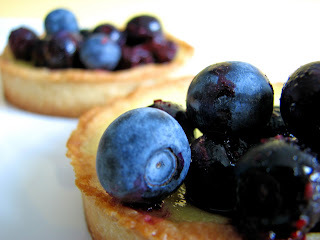 And since I always have the impulse to incorporate fresh fruit into almost every pastry or dessert I make, I added a splash of blueberries to offset the sweetness of the tart dough and lend a burst of flavor and color. Not sure if that’s what they do in the south, but it worked out splendidly in my town. - I made 6 4" tartlets. They baked in just 15 minutes. However, I'd recommend making the full tart because there is more filling to tart shell ratio. 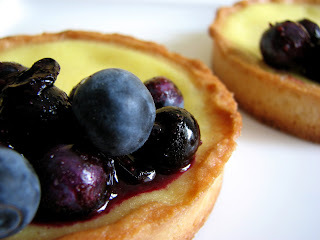 - I’ve also made this tart dough in a food processor using cold butter. The main thing is not to handle it too much. Just place the dry ingredients in the bowl, add in small pieces of cold butter and pulse until the mixture is coarse, add the egg and vanilla and pulse just until it comes together. - If you’d like your blueberries a little saucier, place half the blueberries and just a little bit of water in a saucepan and warm over low heat until the berries pop and become juicy. Remove from heat and combine with the remaining fresh blueberries. - Buttermilk is made from the tangy liquid that remains from churning cream for butter. Commercial buttermilk doesn’t have the true flavor of the old-fashioned product, so the addition of sour cream helps to add back in some of that complexity. Whisk the sugar, flour and salt together. Blend in the eggs, buttermilk, vanilla, lemon juice, zest, sour cream and melted butter and beat until smooth. Pour mixture into a cooled tart shell. Bake until a knife inserted into the center comes out barely clean, about 45 to 55 minutes. Transfer to a wire rack and cool. Serve with fresh warmed blueberries. Roll out the dough between two pieces of parchment paper. Dust one of the pieces of paper with flour, center the disk on it, and dust the top of the dough with flour. Cover with the other piece of paper and roll out the disk into a 12" circle. If the dough starts to stick while you rolling, gently peel back the parchment and dust with flour. Flip the dough and parchment over and repeat on the other side, going back and forth until you have a 12" circle. Remove the top sheet of parchment and invert into a tart pan. Peel off the other piece of parchment and ease the dough into the edges of the pan. Work quickly to form the tart and pinch off any dough overhanging along the edges. Chill the tart shell thoroughly in the freezer for about 10 minutes or so before baking. Bake until slightly golden, about 15 – 20 minutes. Check the pastry halfway through baking and pat down any bubbles that may have formed. Cool on a wire rack before filling. Those blueberries do a great job adding that pop of color now if I could only taste the pop of flavor they give. I'm in FL and have not seen buttermilk pie offered. I want a delicious pastry case and I think I have just found it!!!! Yeahhh, thx for sharing!!! Never had buttermilk tart before, but I do love baking with buttermilk. Is the texture similar to lemon tart? Oh, these are just so beautiful. I love them! 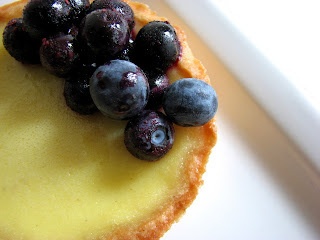 Your pictures capture this tart beautifully! I've never had one either but my goodness those pictures make me wish it was sitting in front of me! 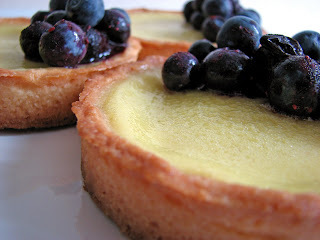 What a great idea to work buttermilk into a recipe for tart filling. I can't wait to try it. Thanks!